Wind is a form of solar energy. Winds are caused by the uneven heating of the atmosphere by the sun, the irregularities of the earth's surface and rotation of the earth. Wind flow patterns are modified by the earth's terrain, bodies of water, and vegetative cover. This wind flow, or motion energy, when "harvested" by modern wind turbines, can be used to generate electricity. The terms "wind energy" or "wind power" describe the process by which the wind is used to generate mechanical power or electricity. Wind turbines convert the kinetic energy in the wind into mechanical power. This mechanical power can be ussed for specific tasks (such as grinding grain or pumping water) or a generator can convert this mechanical power into electricity to power homes, businesses, schools, and the like. Some wind machines have fail-safe shutdown systems so that if part of the machine fails, the shutdown systems turn the blades out of the wind or put on brakes. Wind turbines are often grouped together into a single wind power plant, also known as a wind farm, and generate bulk electrical power. Electricity from these turbines is fed into the local utility grid and distributed to customers, just as with conventional power plants. 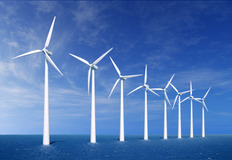 Wind turbines are available in a variety of sizes, and therefore power ratings. The largest machine has propellers that span more than the length of a football field, stands 20 building stories high, and produces enough electricity to power 1,400 homes. A small home-sized wind machine has rotors between 8 and 25 feet in diameter and stands upwards of 30 feet and can supply the power needs of an all-electric home or small business. Utility-scale turbines range in size from 50 to 750 kilowatts. Single small turbines, below 50 kilowatts, are used for homes, telecommunications dishes, or water pumping. Wind energy is a free, renewable resource, so no matter how much is used today, there will still be the same supply in the future. Wind energy is also a source of clean, non-polluting, electricity. Unlike conventional power plants, wind plants emit no air pollutants or greenhouse gases. According to the U.S. Department of Energy, in 1990, California's wind power plants offset the emission of more than 2.5 billion pounds of carbon dioxide, and 15 million pounds of other pollutants that would have otherwise been produced. It would take a forest of 90 million to 175 million trees to provide the same air quality. Although wind power plants have relatively little impact on the environment compared to conventional power plants, there is some concern over the noise produced by the rotor blades, aesthetic (visual) impacts, and birds having been killed (avian mortality) by flying into the rotors. Most of these problems have been resolved or greatly reduced through technological development or by properly siting wind plants. wind energy basics Wind turbines capture the wind's energy with two or three propeller-like blades, which are mounted on a rotor, to generate electricity. The turbines sit high atop towers, taking advantage of the stronger and less turbulent wind at 100 feet (30 meters) or more aboveground. wind energy technolgies Modern wind turbines are divided into two major categories: horizontal axis turbines and vertical axis turbines. Old-fashioned windmills are still seen in many rural areas.